One of the dark points of my time travelling around Sri Lanka was the exposure I had to a number of elaborate scam attempts. While I was in Colombo and Galle I was a target. When you’re alone and clearly a tourist, the con artists come for you with their raft of stories and guilt trips. Here are my stories, in chronological order, of scam attempts I encountered – both successful and failed. If you are travelling to Sri Lanka soon you’ll know what to watch out for! My first experience occurred on my very first day in Sri Lanka. I set off for a walk to start taking in the new country I had arrived in, but it wasn’t long before a local started chatting to me. What a friendly dude! I was stoked, this local – Michael – had supposedly just knocked off work and was keen to show me around and help me get a SIM card. He flagged down a three wheeler and we jumped it. All along I was conscious that it could be a trap and I enquired, as politely as I could, whether he expected anything for his little tour or not. He insisted that he was doing it out of the good of heart. I picked up a SIM card without any trouble. Michael then told me there was some sort of ceremony going on at a temple and that I really should see it. The temple was actually quite cool (although there was an obvious lack of any “ceremony”) – there were a lot of interesting old artefacts, monks walking around, kids participating in Sunday school and a sad, chained up elephant. I felt glad to be getting a decent cultural experience first up. It was after this that the cash grab began. First he took me to a gem shop. I stamped my foot down and said I’m not keen to buy anything, but the persuasion continued for a while. 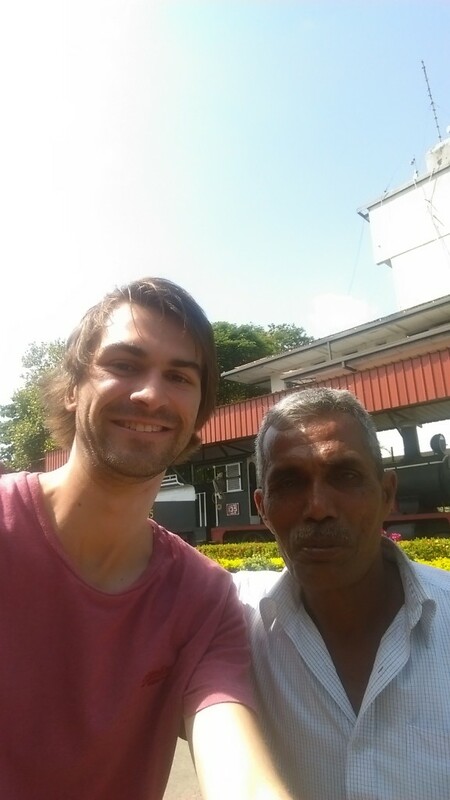 Then we were done – the tuk tuk dropped us at the train station and Michael distanced himself while I dealt with paying the driver. “4,700 rupees”. And that’s where I made a fatal mistake. Not yet used to the exchange rate and with the high amounts of Dong required in Vietnam still in my head, I divided the amount by a thousand instead of one hundred. “$4.70, that’s cheap!” I remember thinking. It wasn’t until later that I realised that I had actually paid $47. If you’ve been, you would know that you could probably get a driver for at least a day for that amount. So I had been fleeced, but I wasn’t quite sure of the whole set up. Michael seemed to flag a three wheeler at random, but perhaps he was circling, waiting for him to appear with an unsuspecting tourist. Maybe they just arranged it on the fly. It wasn’t until a few weeks later, when I was back in Colombo, that I got stung again. A guy in tardy business clothes came up to me in a panic, claiming that his bank card had been eaten at an ATM and that he desperately needed to buy asthma medication for his daughter in hospital. To try and prove his legitimacy he showed me his passport which stated his occupation of “Marketing Executive”. After picking apart all the obvious holes in his story, I couldn’t shake the 5% of me that said “maybe, just maybe he’s not full of rubbish”. That combined with the fact that it was only the equivalent of $10 that he was asking for, led me to handing over the cash. He thanked me, gave me his number and promised to pay the money back that night. I didn’t expect an answer when I rang the number and that ended up being the case. That was the last straw – I was hardened after that and wasn’t giving anybody else any money. Which is good because the worst was yet to come. The next example is pretty light, however. Whilst exploring Galle Fort an older man came up to me and begged for some money to buy his grandchild baby formula from the corner shop. Again, it wasn’t very much but I flat out refused. He told me I could even go to the shop with him and physically buy the product. But I wasn’t having a bar of that either – apparently when you’re gone they just give the goods back to the shop and claim their cash. So that one was easily left alone. The big play occurred on the train back from Galle to Colombo. A fragile old Sri Lankan lady politely asked with sad, hopeful eyes, if the seat next to me was taken. I offered her the seat and, after showing me a toothless smile, she sat down next to me. I also couldn’t help but notice her deformed foot. We started having a very friendly chat. “How long have you been in Sri Lanka”. “Are you here alone” etc etc. But then, after responding very positively to a question about whether I liked Sri Lanka or not, I saw a wave of sadness sweep across her face. “I used to love Sri Lanka” she said. “Until 10 years ago”. The Tsunami, I realised. She went on the explain how she had lost all of her family and that she had nothing left. I couldn’t believe what I was hearing. “I’ve just been to Galle to see the doctor….”, after pausing for effect, she continued “the news is bad, very bad.” She went on to explain how she had cancer and that nothing could be done to save her. She was travelling home to wait for death, alone, and within a couple of weeks. Stunned and heartbroken I sat in silence as she apologised for dumping the information on me, tears streaming down her face. She waited a little while longer, letting the moment build and build, before she finally shattered the illusion that she’d carefully crafted and revealed herself as yet another scam merchant. “You wouldn’t believe it. All I need is 4000 rupees and I could afford a hospital room and get the surgery to save me.” Alarm bells wailed in my head. I was angry. I’d felt genuinely devastated for her, but it was all a trick. I even got snide and asked who she worked for and who organised all the scams. But she stuck at her act and kept the fake tears flowing as she pestered me more and more, trying to guilt trip me into giving her the money. “Anything would help” “I don’t know if it’s a lot of money for you or not” etc etc. From there I just ignored her. She kept up the act until she got off at her station. Talking to other travellers at my Colombo hostel, I discovered that I certainly wasn’t alone. A couple of times it turned out that people had been presented with the exact same story as I had (not the old lady though – I was on my own there). There are plenty of travellers out there who would fall hook, line and sinker for some of these scams and I can only imagine what a lucrative business it must be. It appears as though criminal organisations within Sri Lanka are expertly training these people to carry out their well performed acts. It is also likely that the people on the street, the “artists” that I encountered, see very little of what they fleece out of tourists. They may also suffer abuse from the crime bosses – was that lady’s deformed foot due to an unfortunate accident or something far more sinister? I can only hope that getting my stories out there makes a lot of people more the wiser, subsequently thwarting a far higher proportion of these swindles. Have you had similar experiences in Sri Lanka, or anywhere else for that matter? Tell us about them below!